David Shearer, head of the United Nations Mission in South Sudan (UNMISS) speaks at a press conference at UN Headquarters in New York, 26 April 2017. President Salva Kiir together with his chief rival and former deputy, Riek Machar, signed the deal on Sunday in neighbouring Sudan, alongside members of other opposition factions. David Shearer, head of the UN Mission in South Sudan (UNMISS), explained that it centres on the issue of governance, with Mr. Kiir retaining his position while Mr. Machar will be named the first of five vice-presidents. “The deal is a big step forward in terms of bringing peace in South Sudan,” he told UN News, speaking from the capital, Juba, on Monday. At just seven years old, South Sudan is the world’s youngest nation. However, a December 2013 political impasse between the two rivals, plunged the country into deadly conflict. Tens of thousands have been killed while more than 4 million have been displaced, some 2 million of whom have fled to neighbouring States. Mr. Shearer pointed out that the negotiations in Khartoum were led by Sudan and Uganda: two countries he described as having “the greatest to gain and to lose”, depending on what happens in South Sudan. Previous peace talks were spearheaded by the East African regional body, IGAD — the Intergovernmental Authority on Development. Asked about the prospects for this latest deal, the UN mission chief sided with the optimism expressed by citizens in the capital, including nearly 40,000 displaced people at a UN protection camp near his home who were “partying” on Sunday night. “Our job in the UN is to be as supportive as we possibly can to this agreement,” he stated. “There’s only one agreement on the table. It’s this one. And we’ve got to try and make this work,” he added. The Security Council on Friday narrowly passed a measure aimed at stopping the flow of weapons to armed groups in South Sudan, with those Members in favour saying it would protect civilians, while abstainers voiced concerns that it would undermine the ongoing peace process in the world’s youngest country. 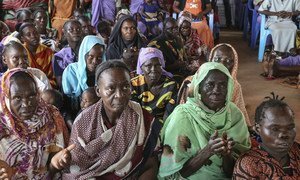 Since the start of the conflict in South Sudan, widespread and systematic sexual violence has been a pervasive tactic of war and terror, said a high-level United Nations envoy, after visiting the war-torn country and hearing “horrific” testimonies.